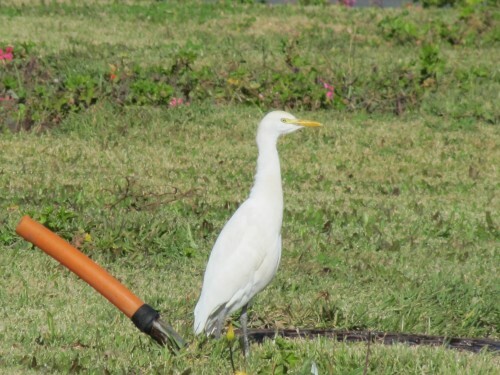 One of the common birds I saw during my visit to Morocco in December 2011 was the Cattle Egret. During the first few days – before we ventured into the drier eastern parts of the country – this species was probably the most common species I saw. Today’s photos were taken in the streets of the capital Rabat. This city has many wide thoroughfares, often with grass verges, an ideal feeding zone for this species. At first I thought this was the Little Egret, a species I am familiar with here in Australia. 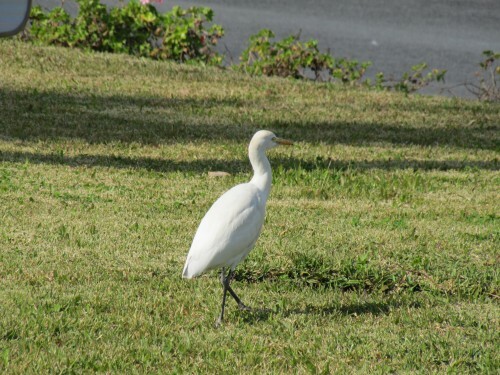 I’ve also seen the Cattle Egret in a number of places in Australia, but the Little Egret is generally more common here. It was only when I arrived home, did some research and looked closely at the birds I had photographed. The yellow bill and the grey legs indicate Cattle Egret. I guess I was confused at first seeing that all the birds I saw showed no signs of the breeding plumage orange colouration. On reflection, this was the middle of winter in Morocco so it is not surprising that they were not in breeding plumage. I also have another excuse: I was birding in a strange country with no field guide to the birds of that country.